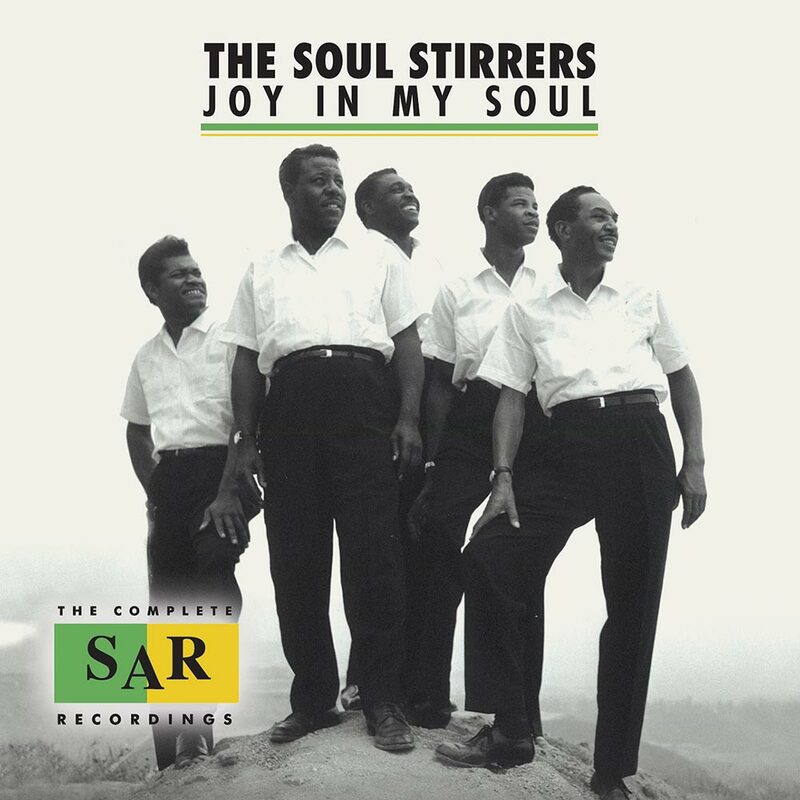 THE SOUL STIRRERS-JOY IN MY SOUL-THE COMPLETE S.A.R. RECORDINGS. The loss of a lead singer can prove fatal to even the most successful groups. Not The Soul Stirrers though. Despite the loss of Sam Cooke in 1957, it was business as usual for The Soul Stirrers. Johnnie Taylor was drafted in to replace Sam Cooke, who had decided now, was the time to pursue a career in soul music. This could’ve spelt the end for The Soul Stirrers, whose music is celebrated on Joy In My Soul-The Complete S.A.R. Recordings, which was recently released by Ace Records. It didn’t though. Johnnie Taylor filled the gap left by Sam Cooke. These were big shoes he was being asked to fill. A lesser man that Johnnie, might have crumbled under such pressure. Not Johnnie Taylor. He and Rebert E. Harris, the other lead tenor were determined that that The Soul Stirrers remained one of gospel’s top groups. That had been the case since 1926, when Senior Roy Crain and some of his friends formed his own gospel group, at Mount Pilgrim Baptist Church, Trinity, Texas. This new group soon became a popular draw. Then one night, after a performance, a member of the congregation congratulated Senior Roy Crain on a “stirring performance.” That night, The Soul Stirrers were born. Sadly, the original lineup didn’t last long. By 1933, Senior Roy Crain had moved to Houston. His reputation had preceded him. Before long, he was asked to join another gospel group, The New Pleasant Green Singers. While Senior Roy Crain was happy to accept the invitation, there was a but. The group had to change their name to The Soul Stirrers. So, The New Pleasant Green Singers became The Soul Stirrers. This latest lineup of The Soul Stirrers would pioneer the use of double lead vocals. Their ability to innovate set The Soul Stirrers apart. They were a cut above most gospel groups. Despite this, members came and went. Sometimes, when their numbers were low, The Soul Stirrers had to “borrow” a one of the congregation for a performance. For a night, they became an honorary Soul Stirrer. However, three years after the latest lineup of The Soul Stirrers took to the stage, they added a new member, bass singer Jesse Harris. As gospel singers go, Jesse Harris was unique. He sung high tenor lead. This was a new development in gospel music. An added bonus was, that Jesse Harris had been writing songs since he was eight. With Jesse onboard, The Soul Stirrers were on their way to becoming gospel’s biggest group. This had its advantages. Now the top gospel songwriters were willing to give The Soul Stirrers first pick of their new material. Among them, were Kenneth Morris and Thomas A. Dorsey. They had established a reputation as the top gospel songwriters. Now gospel’s top group were singing songs written by the top gospel songwriters. It seemed that The Soul Stirrers’ star was in the ascendancy. That proved to the the case. The Soul Stirrers made their recording debut in 1939. Then a year later, in 1940, The Soul Stirrers were given their own show on WIND radio. This meant The Soul Stirrers’ music was heard by a much wider audience. For The Soul Stirrers, this was just the start of their rise and rise. Soon, The Soul Stirrers were touring coast to coast. Hailed as gospel’s best, and most innovative groups, The Soul Stirrers played to pack houses night after night. Each night, The Soul Stirrers were winning friends and influencing people. So, it’s no surprise that in 1946, they signed to Los Angeles’ based Aladdin Records. The Mesner Brothers had founded Aladdin Records. It was perceived as a suitable label for The Soul Stirrers’ recordings. With Rebert Harris and James Medlock sharing lead vocals, they recorded The Lord Will Make A Way and Remember Me. They became The Soul Stirrers’ first two releases. This was the start of The Soul Stirrers’ lengthy recording career. For the next three years, The Soul Stirrers called Aladdin Records home. Their final session was in December 1948. That day, the seven members of The Soul Stirrers recorded twelve tracks. By then, James Medlock had decided he no longer would tour with The Soul Stirrers. However, he still appeared on a few tracks. His replacement was Paul Foster, who joined The Soul Stirrers in later 1949. This was perfect timing. With The Soul Stirrers having left Aladdin Records, they signed to Speciality Records, another Los Angeles’ based independent label. Their first recording for Speciality Records took place in February 1950. That day, they recorded several tracks, including By and By, which featured one of Jesse Harris’ finest moments. Sadly, it proved to be one of his final recordings for The Soul Stirrers. Five months later, The Soul Stirrers returned to the studio. This was the last time Jesse Harris featured on a Soul Stirrers’ session. Not long after this, he founded The Christland Singers. For The Soul Stirrers, this presented a problem. For a while, Paul Foster tried to carry the burden of being the sole lead singer. However, it was too much. The Soul Stirrers desperately needed someone capable of filling Jesse Harris’ shoes. However, Senior Roy Crain, Jesse James Farley and R.B. Robinson had a man in mind…Sam Cooke. The three members of The Soul Stirrers had been mentoring Sam Cooke for a while. It was as if they realised that this day might come. However, the only problem was Sam Cooke was a member of The Highway QCs, another gospel group. With their blessing, Sam Cooke left The Highway QCs and made his Soul Stirrers’ debut in January 1951. That night, in January 1951, Sam Cooke took to the stage with rest of The Soul Stirrers in Pine Bluff, Arkansas. Straight away, it was apparent that Sam Cooke was more than capable of filling the gap left by Jesse Harris. Some people, however, still had their doubts. When Sam Cooke arrived for his first recording session with The Soul Stirrers, it was decided that the rookie should take the lead on Jesus Gave Me The Water. Art Rupe, who owned Speciality Records, had his doubts. Then he heard Sam Cooke deliver a spellbinding performance. So impressed was Art Rupe, that he agreed that Jesus Gave Me The Water should be The Soul Stirrers’ next single. This was the start of five years of unrivalled commercial success for The Soul Stirrers. Between 1951 and 1956, The Soul Stirrers’ reputation as gospel’s biggest and most successful group was reinforced. A new member, guitarist Bob King, joined in 1953. Sadly, he died a year later. His replacement was Leroy Crume, a friend of Sam Cooke’s. Just like Sam, Leory was able to enjoy some of the most successful times in The Soul Stirrers’ history. Hit singles included He’s My Friend Until The End, Touch The Hem Of His Garment, Wonderful and Nearer To Thee. Then in 1956, Sam Cooke announced he was leaving The Soul Stirrers. This wasn’t a surprise to members of The Soul Stirrers. Sam Cooke had been toying with crossing over. Their was more money to be made singing soul. Commercial success and critical acclaim was tantalisingly within reach. So was fame and fortune. It was hard to resist. Eventually, Sam Cooke left The Soul Stirrers, and eventually, was replaced by Johnnie Taylor. Before that, Johnny Jones of The Swannee Quartet tried to fill the gap left by Sam. Johnny made his way from Augusta, Georgia, and was given the role of filling Sam Cooke’s shoes. His were big shoes to fill. Although Johnny tried his best, things didn’t work out. He got homesick and seemed to have Georgia on his mind. So Johnny headed home. This presented a problem. The Soul Stirrers needed a lead singer. So, in early 1958, Leroy Crume was sent on a mercy mission. His job was to convince Johnnie Taylor to join The Soul Stirrers. Johnnie Taylor, it seemed, had been in The Soul Stirrers’ for some time. Senior Roy Crain and the rest of The Soul Stirrers had been keeping an eye on their future lead tenor. This included Leroy Crume, who remarked that Johnnie Taylor sounded not unlike Sam Cooke. Sonically, it seemed The Soul Stirrers were replacing like with like. Johnnie Taylor made his Soul Stirrers on The Love Of God. After this, The Soul Stirrers only recorded one more session for Art Rupe’s Speciality Records. He freed them from their contract in 1959. This could’ve spelt disaster for The Soul Stirrers. It didn’t. Freed from the shackles of their recording contract, Sam Cooke, J.W. Alexander and Senior Roy Crain formed their own record company, S.A.R. Records. Two of its first and biggest signings were Sam Cooke and The Soul Stirrers. The Soul Stirrers’ S.A.R. Records debut was Stand By Me Father, with He’s Been A Shelter For Me on the B-Side. Both tracks were recorded on 1st September 1959 at Chicago’s Universal Recording. Producing the two tracks was former lead singer, Sam Cooke, who penned both tracks with J W. Alexander. Stand By Me Father was released as a single in October 1959. Despite its undoubtable quality, commercial success eluded Stand By Me Father. However, Sam Cooke and J.W. Alexander had the perfect followup, Wade In The Water. When Sam Cooke and J.W. Alexander penned Wade In The Water, they had Paul Foster in mind. He comes into his own on Wade In The Water, which had been recorded at the sessions on 1st September 1959. For the B-Side, He Cares was chosen. Not to be outdone Johnnie Taylor delivers a vocal masterclass on He Cares. With two quality cuts, The Soul Stirrers’ second single for S.A.R. Records was released. Again, although it was successful within gospel circles, Wade In The Water failed to crossover. While this was worrying, The Soul Stirrers had a bigger problem. Johnnie Taylor’s private life was proving messy. He’d been involved in a car crash, where he ran over a young girl. Afterwards, it transpired that Johnnie was under the influence of marijuana. For the squeaky clean Soul Stirrers, this was bad news. Realising this was the end of the road for Johnnie with The Soul Stirrers, he quit the group. Seeking redemption, he became a preacher. Briefly. By 1961, Johnnie Taylor was back, in The Soul Stirrers. Now The Soul Stirrers were looking for a replacement for Johnnie Taylor. Ronnie Williams threw Jimmy Outler’s name in the ring. He met The Soul Stirrers in Philly. Sam Cooke however, had his own thoughts. He favoured Joe Ligon. With the two men vying to replace Johnnie Taylor in The Soul Stirrers, the only solution was hearing the both live. Luckily, both men were starring at a concert with their respective quartets. When the big night came, Jimmy Outler and Joe Ligon went head to head. Eventually, The Soul Stirrers’ original choice won out, Jimmy Outler was a Soul Stirrer. He made his recording debut between the 6th and 7th September 1960. Over two days, the latest lineup of The Soul Stirrers recorded a number of tracks. By the 7th September 1960, they were finished and had enough material for several singles. The first single taken from the September 1960 sessions was Jesus Be A Fence Around Me. It was penned by Sam Cooke especially for Jimmy Outler. He delivers an impassioned rendition of Jesus Be A Fence Around Me. On the flip side was I’m A Pilgrim. What was Jimmy Outler’s Soul Stirrers’ debut was released in September 1960. Hard on its heels came Listen To The Angels Sing. Just a month later, in October 1960, Listen To The Angels Sing, with Tolling On on the B-Side was released as The Soul Stirrers’ fourth single for S.A.R. Records. Just like Jesus Be A Fence Around Me, Listen To The Angels Sing proved that The Soul Stirrers were still one of gospel’s biggest draws. However, they weren’t crossing over. What S.A.R. Records needed, was that elusive crossover single. Despite a hit single eluding The Soul Stirrers, they released their debut album Jesus Be A Fence Around Me in January 1961. It consisted twelve songs, including the previously unreleased Don’t Leave Me Alone. The twelve tracks were recorded by The Soul Stirrers during 1959 and at the sessions on 6th-7th September 1960. This was the last anyone heard from The Soul Stirrers for five months. It wouldn’t until June 1961 that The Soul Stirrers released another single. That was the Paul Foster penned I Love The Lord. On the flip side was I’m Thankful on the flip side. Both tracks had been recorded during the September 1960 sessions and featured on The Soul Stirrers’ debut album, Jesus Be A Fence Around Me. However, in September 1961, Sam Cooke decided it was time for The Soul Stirrers to enter the recording studio again. On 20th September 1961, just over a year after their last recording session. It hadn’t exactly proved fruitful. The Soul Stirrers still hadn’t crossed over. Maybe this session would prove more fruitful? Just like before, The Soul Stirrers recorded a number of tracks. This included Lead Me Jesus and Heaven Is My Home. They became The Soul Stirrers’ next single. Released in October 1961, this was one of The Soul Stirrers’ finest efforts. Even the B-Side, Heaven Is My Home, which trod the line between gospel and soul, oozed quality. To onlookers, success wasn’t far away for The Soul Stirrers. It seemed they were on the right lines. The September 1961 sessions spawned The Soul Stirrers’ next single, the Leroy Crume penned Lead Me Jesus. With Johnnie Taylor’s God Is Standing By on the B-Side, these two tracks became The Soul Stirrers second single of 1961. It was released in October 1961, complete with over-dubbed strings. The two tracks also featured on The Soul Stirrers’ sophomore album, Gospel Pearls, which was released in 1962. By then, The Soul Stirrers would’ve released their first single of 1962. This was Must Jesus Bear The Cross Alone. Released in January 1962, The Soul Stirrers were still one of gospel’s leading groups. Meanwhile, their label mate and former member, Sam Cooke was one of soul’s biggest names. What The Soul Stirrers would’ve given for just a modicum of that success. To enjoy that success, The Soul Stirrers would have to release a single. They hadn’t released a single since January 1962. The rest of 1962 passed without The Soul Stirrers entering the recording studio. It wasn’t until February 1963 that the call came. The Soul Stirrers were to head to Universal in Chicago. At Universal, The Soul Stirrers recorded nine tracks. Praying Ground was released as a single in March 1963. On the flip side, was the Leroy Crume composition No Need To Worry. These two tracks became The Soul Stirrers’ first single since January 1962. Still a hit single eluded The Soul Stirrers. Maybe next time? Another six months passed, before The Soul Stirrers released Free At Last. This was another Leroy Crume penned track. An inspirational track, driven along by the rhythm section, The Soul Stirrers married gospel and soul. It seemed, The Soul Stirrers weren’t going to stand still. They realised it was a case of evolve or become irrelevant. Despite this, success eluded them. For The Soul Stirrers, it would be another eleven months before they returned to the studio. Before that, The Soul Stirrers would release their sophomore album. This was Encore!! With The Soul Stirrers. Released in 1963, it featured the ten tracks recorded at Universal on 27th February 1963. The Soul Stirrers wouldn’t release another studio album for four years. By then, The Soul Stirrers were signed to Checker Records. In the three preceding years, lot of water had flown under the bridge. As 1964 began, The Soul Stirrers entered the studio on 28th January 1964. They recorded their next single Oh Mary, Don’t You Weep. Penned by Sam Cooke, it was recorded at United Recording, Hollywood. For the B-Side, Clyde Otis and Brooke Benton’s Looking Back was chosen. Released in February 1964, the single failed to chart. Worse was to come though. On 20th July 1964, The Soul Stirrers recorded what would prove to be their S.A.R. Records’ swan-song, Lead Me To The Cavalry. It was arranged by Sam Cooke, who also sung backing vocals. Released in August 1964, this would prove fitting. Four months later, on December 11th 1964, tragedy struck. That night, Sam Cooke died on 11th December 1964 aged just thirty-three. Police reports state that Sam Cooke booked into the Hacienda Motel, Los Angeles earlier on the 11th December 1964. Later, things went awry. Sam Cooke burst into the manager’s office-apartment in a rage, wearing nothing but one shoe and a sports jacket. A furious Sam Cooke, wanted to know where the woman who accompanied him into the Hacienda Motel was. Feeling threatened, Bertha Franklin, the motel manager, shot Sam Cooke through the heart. When the L.A.P.D. arrived, Sam Cooke was found wearing just his sport’s jacket and a shoe. It was a surreal sight. Since then, Sam Cooke’s somewhat unsavoury death has been shrouded in controversy. Nobody knows for certain what happened. Was Sam in the wrong or wronged? Even today, nobody knows. Rumours and conjecture surround what happened at the Hacienda Motel, Los Angeles. Sadly, we’ll never know for sure the truth surrounding Sam Cooke’s death. His death impacted on all the groups on S.A.R. Records. This included The Soul Stirrers. The death of Sam Cooke affected The Soul Stirrers badly. He was their producer and previously, had written songs for The Soul Stirrers. Some would go as far as say that Sam Cooke was The Soul Stirrers’ mentor. Certainly, his death impacted badly upon The Soul Stirrers’ career. After the death of Sam Cooke, SAR Records folded. Sam Cooke was its driving force. Without him, SAR Records collapsed. This left The Soul Stirrers without a label. They continued, but it was getting harder for The Soul Stirrers to make a living. Gospel was no longer as popular as it had been. It wasn’t until 1967 that The Soul Stirrers released their next studio album Resting Easy. By then, secular music had usurped gospel. Its glory days were long gone. That may have been the case, but The Soul Stirrers’ name will forever be synonymous with gospel music. They were innovators, who pioneered the swing lead, where two singers share the lead vocal. This added to the emotional quality of the song, without disturbing the harmonies. pioneered the “swing lead”, in which two singers would share the job of leading the song. This increased the emotional quality of the song, with disturbing the harmonies. The Soul Stirrers’ innovation transformed gospel, and can still be heard today in soul music. So, although The Soul Stirrers’ glory days are long gone, their influence can still be heard today. Fifty-one years after The Soul Stirrers’ S.A.R. Records’ swan-song, The Soul Stirrers music is celebrated on Joy In My Soul-The Complete S.A.R. Recordings, which was recently released by Ace Records. Joy In My Soul is a two-disc, thirty three track compilation featuring the music The Soul Stirrers recorded for S.A.R. Records between 1959 and 1964. There’s singles, B-Sides, album tracks and previously unreleased tracks. For anyone interested in The Soul Stirrers’ music, then Joy In My Soul-The Complete S.A.R. Recordings is a two disc treasure trove, featuring The Soul Stirrers’ post Sam Cooke years. ← TERESA BREWER WITH COUNT BASIE & THAD JONES -THE SONGS OF BESSIE SMITH/DUKE ELLINGTON WITH TERESA BREWER-IT DON’T MEAN A THING IF IT AIN’T GOT THAT SWING.